What is a domain name? Where can I get a domain name? What is a cPanel? How do I install a word press site? What plugins will I need? Will my word press website need updating? Will it really help my business make more money? How can I use my blog to help my business grow? 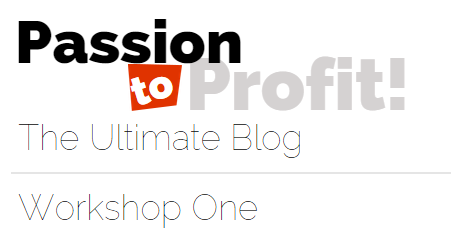 Passion to Profit | Setting up the Ultimate Blog. i Steve Gaghagen will show you how to set up your ultimate blog from start to finish during this one and a half hour workshop. The Ultimate Blog for unlimited marketing potential. What will I write about? What are categories? How are categories different from tags? How do I use categories and tags? How often should I add a new post? How long should my post be? What about sales pages? What are keywords and keyword phrases? How do I find good keywords? What topics should I write about? Where can I find good topic ideas? 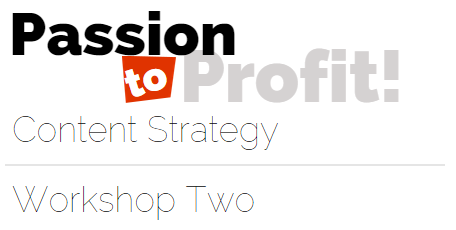 Passion & Persuasion | Content Strategy is a workshop will answer those questions and more! Your content strategy must be designed in a way that illuminates your passion and expertise to gain to achieve your overall should not only provide shareable and timely information, it should also be presented in a logical and meaningful way to your website visitors. You only have one chance to make a good impression. Lets face it business is about getting the sale. Your business should also be your passion. If it isn’t your will never find true success. Your content strategy must reflect your passion. Every piece of content you share must persuade your viewers to take some sort of action. Asking people to Share your post will get you more traffic and new subscribers. What is keyword research? How will keyword research help me write articles? Will good keywords and keyword phrases help me make money? How do I build a subscriber list? Do I need an auto res-ponder? What is a lead capture page? Do pop up subscriber boxes work? How do I set up a pop up subscriber box of my own? Content Marketing is a marketing strategy that can bring you a windfall of traffic and conversions. In order to find that inbound traffic you need to do everything you can to serve up content that is relevant for your niche. That is where keyword research comes in. You will learn to identify profitable keywords and topic ideas all using the free google keyword tool. The number one goal in business is to build a list of readers who are interested in what you say and how you say it. Readers are encouraged to subscribe with a variety of time tested strategies. And we cover them all. Lead capture pages, splash pages, pop up subscribers forms and newsletter sign ups. LIFETIME MEMBERSHIP at Contact List Builder! Your membership in our Blogging Workshop also includes a lifetime membership in Contact List Builder along with all the perks and benefits! Take Your Passion to Profit. 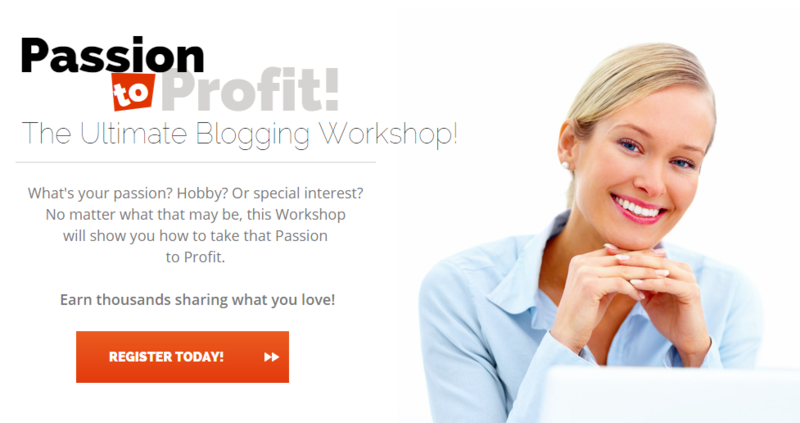 Important Information for all Registrants Please note once you have purchased the Workshop through PayPal you will be directed to register a free membership account at Curation Works the creators of Passion to Profit, the Ultimate Blogging Workshop. If you are already a member of Curation Works you will simply ignore this step. All accounts will be upgraded manually, so be patient. We will provide you private membership access where you will be able to access Workshop Replays 24/7, anytime and anywhere. This is where you will access all workshop material and future helpful information and materials. Income statements and examples on this blog are not intended to represent or guarantee that everyone will achieve the same results. Each individual’s success will be determined by his or her desire, dedication, marketing background, product, effort and motivation to work and follow a program. There is no guarantee you will duplicate the results stated here. You recognize any business endeavor has inherent risk for loss of capital. Materials in our products and our blog may contain information that includes or is based upon forward-looking statements within the meaning of the securities litigation reform act of 1995. Forward-looking statements give our expectations or forecasts of future events. You can identify these statements by the fact that they do not relate strictly to historical or current facts. They use words such as “anticipate,” “estimate,” “expect,” “project,” “intend,” “plan,” “believe,” and other words and terms of similar meaning in connection with a description of potential earnings or financial performance.